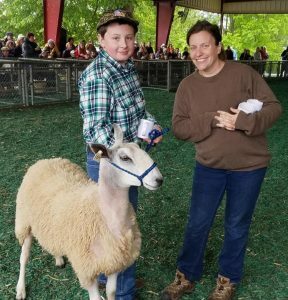 Introducing the 2017 Youth Conservation Program Recipient of the Bluefaced Leicester Yearling ewe, donated this year by BLU member Meredith Myers-Null of Maryland. I am Charlie O’Boyle from Cumberland, MD. I am a 4-Her in the Mountain and Valley 4-H livestock club in Allegany county. Sheep have always been a part of my life as well as my family as it was a smaller livestock that my brother and I could handle easier when we were younger. My family helps me with my projects and in keeping them updated and in helping me work with my sheep and other animals. One of the most peaceful places I have found is the barn though. When I am not in school that is where I am usually found. I love being in the barn working with the sheep and other animals with my golden retriever. I make sure that they are worked with, taken car of and in preparing them for shows and in showing the animals. I am hoping that by participating in the Youth Conservationist Program on my own project it will allow me to help preserve our past and the farming way of life and to share it with others. I have helped my brother with his YCP project this past year through helping to care for his sheep as well as in telling others about the importance of sheep in our lives.